Prayer can bring to each of us a peace and a calm and a sense of unity with The Universe, but it takes art and music to fluently speak about this grace. 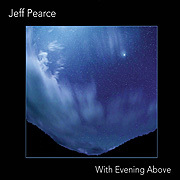 With Evening Above (54'11") is guitarist Jeff Pearce's vivid pictorial dream music. Beautiful in its curvature and ascension one cannot listen to this album without being drawn into a higher more ethereal realm. 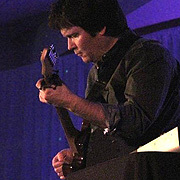 Alive with feeling Pearce's eight miraculous constructs are more than just the simple feedback imagination displayed by other mainstream guitarists. The smooth spacey tracks on With Evening Above offer a rearrangement of reality. These are Pearce's wholly invented cosmic soundscapes, conjured through digital wizardry and manipulated in ways we cannot even imagine. The stacking of long tones and slow melodic lines yield an interesting harmonic motion, as well as resonate with new and unpredicted timbre (this even more so in the concert setting of a cavernous church sanctuary where Pearce has been known to occasionally perform his works live for an audience). The few active, structured tracks provide an immediacy - felt through the transmittable design of Pearce's personal revelations. These are composed, consonant vignettes of plucked electric echo-guitar. In the interlock of picked strings and digital delay these tracks twine up, down and through sober-steady arpeggiations. Asking for our presence these songs are slow, methodic, melodic, multi-layered and drenched in reverb. The long zone which concludes With Evening Above ventures into the realm of private understandings - things that largely go unspoken. Combining the fundamental materials of music, sonics and time, Pearce's individual sounds are diffused in a continuous conformation. Gradually changing but always with a minimum of incident his guitar-studio color and harmony float in space. Working in this manner Pearce is able to examine complex emotional themes without trivializing them. Since it moves only forward most people loath Time. Throughout Pearce's music, the unification of sustained tones, static textures, consonance and modal harmony suggests the idea of this music as an immeasurable space - one which we may temporarily dwell in, outside of the inevitable passage of time.